The text of Albert Lozeau's poem, Musique, published in the collection L’Ame solitaire (Montreal 1907), refers to music being used to enhance the words of religion, patriotism, and the expression of a whole range of human emotion. This recording of songs drawn from the publications of the Canadian Musical Heritage Society, CMH volumes 3, 7, 10, 12, and 14 reflect all of those areas. Those volumes, the individual songs as sheet music, and the Historical Anthology of Canadian Music (HACM) are all available from Clifford Ford Publications (www.cliffordfordpublications.ca). The first examples of music written for a solo voice with accompaniment by a named Canadian composer are from operas by Joseph Quesnel (1749-1809). This recording includes the two airs sung by the heroine of Colas et Colinette (1789). In the early nineteenth century separate pieces for the solo voice usually with piano accompaniment began to appear. These fall into various categories such as patriotic song, religious, or the developing genres of art song and mélodie. Apart from the early operatic selections the next earliest example included on this recording is the patriotic song, The Merry Bells of England (1840). Published by John Lovell in Montreal for the Bytown (later Ottawa) -based composer J.F. Lehmann (ca. 1795-1850), this is the first or among the first sheet music printed in Canada. Although its words are religious in nature, One Sweetly Solemn Thought (1876) by Hamilton-based Robert S. Ambrose, became one of the most popular songs to ever be published in the nineteenth century. It fulfilled the purpose of being an appropriate song to sing in the parlours of homes that would not permit any non-sacred music to be performed on Sundays. At the same time it could be sung in soireés musicales or on the stage along with examples of art song or selections from operas and operettas. Many of the art songs included here have texts similar to those being used by European composers such as the English translation of words by the German poet Heinrich Heine (1797-1856) in The Wings of Song. Others reflect Canadian settings and references. Mrs. GA. Gilbert set her husband's words that glorified the Don River of Toronto in Come to the Vale of the Beautiful Don (ca. 1879). In the Indian Maid's Lament Edward R. Manning (1874-1948) sets the words of the Canadian poet John E. Logan that refer to the quintessential Canadian bird, the loon, and supposedly captures the sentiments of an indigenous woman. Ottawa­based Ernest Whyte (1858-1922) used a poem of Duncan Campbell Scott that describes an evening scene in Hull (Gatineau) for The End of the Day. Other poems even when penned by Canadians have more universal themes such as to be found in Lionel Daunais' Les Puces savantes or Barbara Pentland's A Lavender Lady. To conclude this recording a selection of songs from the range of operas and operettas produced in Canada during the late nineteenth century and early twentieth century has been chosen. The Governor­General and Lady Dufferin encouraged the production of plays and operettas at Rideau Hall during their official residence in Ottawa. One of these was the The Maire of St. Brieux (1875) with a libretto by Frederick Augustus Dixon (1843-1919) and music by Frederick W. Mills. After its production in 1875 the opera with five main characters, a chorus of 36, and an orchestra, was remounted at the Grand Opera House in Ottawa on 25 March 1876. "Only a Daisy" is an aria sung by the Comtesse de Beaudry impersonating Madame Barre. Leo, the Royal Cadet (1999) by Kingston-based Oscar Ferdinand Telgmann was the most often performed Canadian staged musical play prior to Anne of Green Gables. Based on a story revolving around the Royal Military College in Kingston, this operetta for 16 soloists, chorus and orchestra, had at least 150 performances in Ontario and New York state before 1925. Caroline, the forward-looking feminist, is the friend of the heroine Nellie in love with Leo. Gisèle with music by Alphonse Lavallée-Smith, a first cousin, once-removed of Calixa Lavallée, the composer of Canada's national anthem, is based on action taking place in a Quebec village in 1911. Albert Leroux, the hero, has had to leave Canada and his beloved Gisèle to pursue his career as an opera singer in Europe. The opera has a happy ending because Albert can find work with the newly formed Montreal Opera Company, active from 1910 to 1913. In this effective melodrama, a spoken soliloquy, Gisèle underlines her determination to wait for Albert in spite of pressures from her grandfather and other suitors. William Dichmont (1882-1943) was active in the Winnipeg musical scene from 1903 to 1915. His musical Miss Pepple (of New York) (1909) falls into the forms of operetta being produced by Ivor Novello in London, and Jerome Kern in New York. In its 1909 and 1911 productions with three main characters, a chorus of 45, and orchestra, the hit was "Simple Maid" sung by Cynthia, a musical comedy star, but impersonating Miss Pepple, the daughter of a rich American widow. Gloria Jean Nagy holds a Master of Music degree from the University of Western Ontario as well as an ARCT diploma. Since 1984 she has been a vocal instructor at Carleton University and a vocal tutorial instructor of Canterbury Arts High School. Ms. Nagy has been broadcast many times by CBC Radio, Radio-Canada, and Rogers Cablevision. She maintains a busy vocal studio in addition to her solo and choral conducting concert career. An examiner for Conservatory Canada, Ms. Nagy is in demand as an adjudicator for music festivals throughout Canada. She is an active proponent and performer of Canadian music. For many years, Ms. Nagy was the Ottawa co-ordinator for Contemporary Showcase (ACNMP) and is now the vocal co-ordinator for Canadian Music Showcase / Carrefour de la musique canadienne for which she edited the vocal syllabus. She was the featured singer on the recording The Music of Mary Gardiner (Conservatory Canada CD 3555). Elaine Keillor is an internationally known concert pianist, and a Distinguished Research Professor Emerita at Carleton University, Ottawa. With all of the theoretical requirements completed at the age of ten, she remains the youngest to have ever received the Associate diploma in piano from the Roval Conservatory of Music (Toronto). As a pianist she can be heard on fourteen CDs that have been praised for their impeccable pianism and artistry. She was the first recipient in the category of Arts and Culture of the Canadian Women's Mentor Awards, February 1999. Having written essays for various encyclopedias and dictionaries, she was the contributor on music for the widely used third edition of Profiles of Canada (2003), edited four volumes in the 25-volume Canadian Musical Heritage series, two in the piano series Perfornaing Our Canadian Heritage, and authored John Weinzweig and His Music: The Radical Romantic of Canada (Scarecrow Press, 1994), and, Music in Canada: Capturing Landscape and Diversity (McGill-Queen's University Press, 2006). Dr. Keillor received the 2004 Helmut Kallmann Award of the Canadian Association of Music Libraries, Archives and Documentation Centres. She is the team leader for the production of the websites Native Drums (www.nativedrums.ca), and Native Dance (www.nativedance.ca) on musical expressions of the First Peoples within Canada. 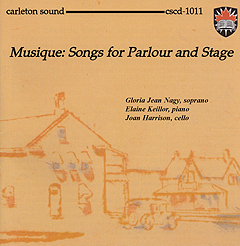 Joan Harrison settled in Canada in 1991 after participating regularly in the contemporary music scene of New York as well as being the associate principal cellist of the New York City Opera. Now she is active as a cello performer and teacher in solo, chamber and orchestral music based in Ottawa. Over the past decade Ms.Harrison has performed premieres and works by Mary Gardiner, Steven Gellman, Ben Glossop, Deirdre Piper, and Leon Zuckert among others. Recorded at St. Paul's Presbyterian Church, Ottawa, July 13-14, 2006. Cover Art: David Milne, Yard of the Queen's Hotel (Third Version). 1937, colour drypoint, The Jack and Frances Barwick Collection, Carleton Unversity Art Gallery. Click on the disk image at the top of any page to return to the Carleton Sound Home Page.